Hello my faithful readers. Once again it is time for an update. 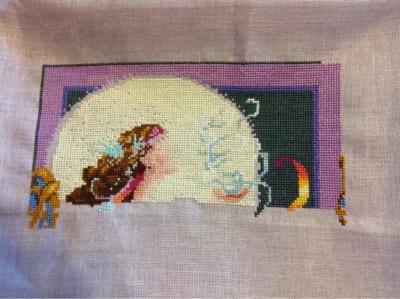 As you can see from my August TUSAL update from yesterday, I have not been stitching as much. 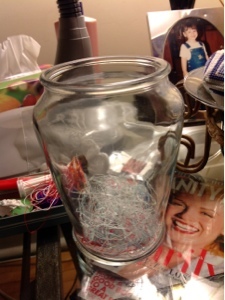 That is because shortly after I updated everyone on my Christmas in July ornaments, I sliced off the finger tips of my right index and middle fingers, and couldn't stitch. I was slicing potatoes with one of those mandolin-style slicers. Thanks heavens for my DD. She was a trooper. She finished making supper and helped me out for the next week with housework and meals. I made a trip to the ER the next day because I couldn't get the bleeding to stop. But I am back to stitching with a vengence now. They are all healed up, but the teensiest bit tender yet. On to the updates now. 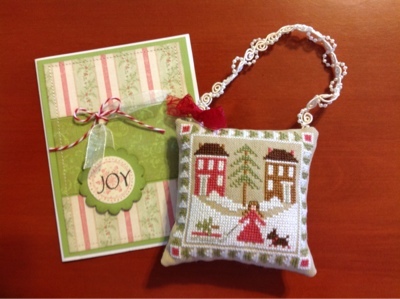 First here is the ornament and card from my Christmas in July partner, Tricia. I just love it! She did such a beautiful job, and her card is so pretty! Thank you so much, my friend! I have it out where I can see it everyday. 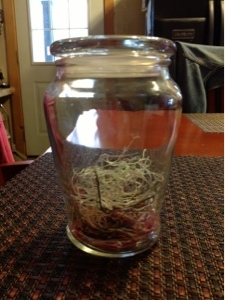 Here is my Silver Moon Tea from Mirabilia. She is almost half done now. Coming along much better since I restarted. 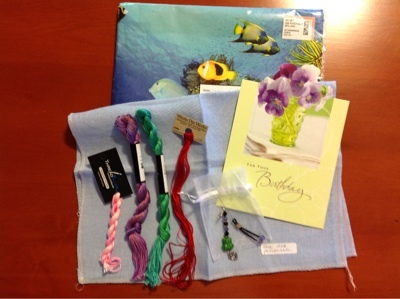 I really have to thank Barbara C. She sent me an on-line gift certificate earlier in July for the Birthday Thread Exchange for The Stitch Specialist Yahoo group. And then this lovely card and DMC threads came as well. Thank you so much again, Barb! With all you are going thru, this was so lovely and thaoughtful. I just fell in love with this ornament from the 2007 JCS Ornament issue. This will be for my Dad for Christmas. We both have this bird visit our feeders, so I think he will like it! Yes, I have started a new SAL. (You know I can't help myself! lol) It's called Confetti of Hardanger by Bee's Needleworks. Abi Gurden, owner of The Stitch Specialists Yahoo group designed it, and you can only stitch it by being a member of the group, and for a small fee. Part One is finished above, and will be starting Part 2 very soon. 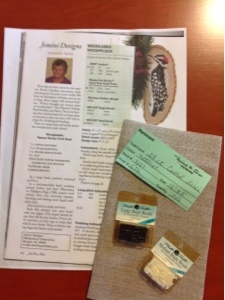 My fabric is 28-count Laguna in Queen Anne's Lace, with Caron Watercolors and Wildflowers in Moss and Autumn Leaves, and white DMC Perle cotton 8 and 12. I am pleased with how the colours look against the fabric. 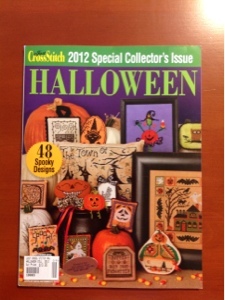 I grabbed this magazine because I liked the Halloween and Christmas ornaments in it. I used to have a subscription to this mag, but wasn't thrilled with everything in it, so I only buy it if I like a bunch of projects. Now I am very excited about this next project! You know I love my gingerbread, and Hubby bought me this project! Isn't he a sweetie?! 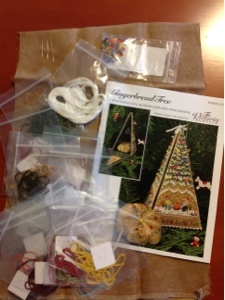 It's The Victoria Sampler Gingerbread Tree Etui Stitcherama cyberclass! It is a two-week class towards the end of September. 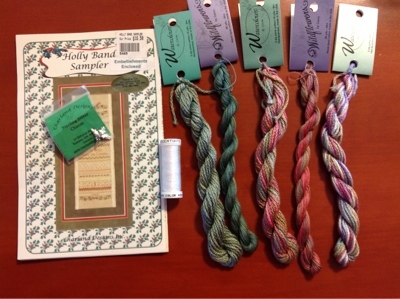 I have all the threads organized, but need to prepare the fabric and start cross stitching. That will be today's job! 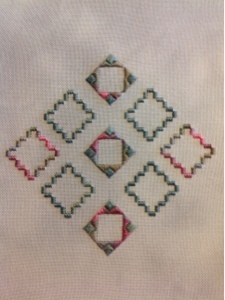 I would like to have all the cross stitching done in time for the class, so I can concentrate on the specialty stitching and finishing. Wish me luck, and I'll keep you posted. And last but not least are these cute charts sent to me by Joanne P. She was my partner for the Chocolate Exchange for The Stitching Hangout Yahoo group. I sent her some chocolate-related threads and fabric, which I hope she gets soon! 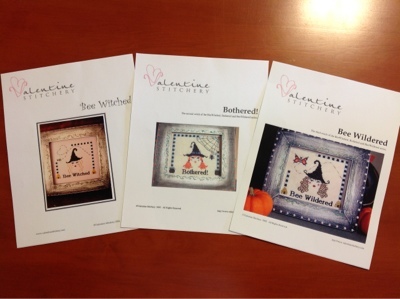 She saw my Stoney Creek Witch finish, and asked me if I would like these charts. 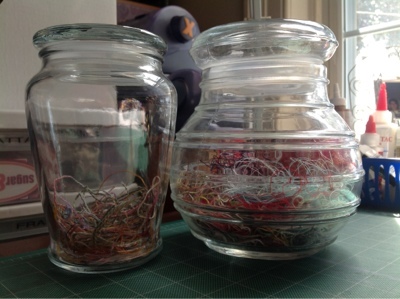 She won them as a door prize, said she wouldn't stitch them, and was looking to re-home them. I would like to work on them this fall. They would be a lovely addition to my on going Halloween decor. Thanks again, my stitchy friend. I will share progress pics when I start them. Just a note to all, I have been using my iPad to post to my blog. My laptop is not at all well, and I use it sparingly, only for very important missions. My Blogger app does not place pictures in the order I take them, so I write about them in the order they are placed. I have tried to manipulate them, but I end up frustrated, so it is my laziness and fear of deleting pictures that my blog is the way it is. Well, I have come to the end of another update. I am doing laundry, so in between loads I will be preparing my fabric for the Gingerbread Tree Etui. As well will be watching The Iron Lady from my DVR and The Hunger Games I downloaded to my iTunes account with DD later on. Hope everyone enjoys the last couple weeks of summer, winter for the southern hemisphere. It's lovely here in SW Ontario, where after the last month and a half it's been stifling, hot and muggy, I now have windows open and a cool breeze blowing gently. Chat soon, everyone! Hello my faithful readers. I only have time for quick update today. I am a day late for August's TUSAL and will be busy for the rest of the day. 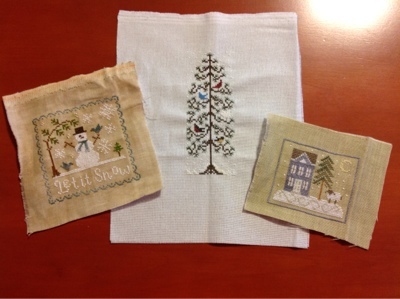 I promise to fill you in on all my stitching adventures tomorrow, when I have more time. Until then, chat soon! 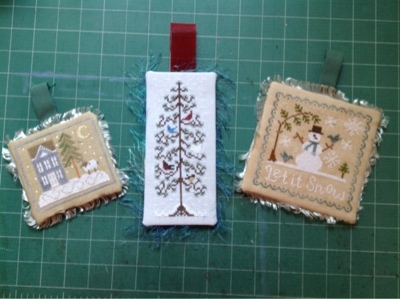 Well my faithful readers, my ornaments are done! All done but the drying. 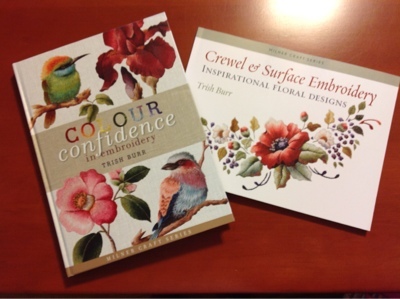 These little treasures will sit on my craft table until tomorrow, then one will wing its way to my partner, Tricia. The others are for me, or maybe not. Someone might get one for Chistmas. I am so happy they are done! Till next time, chat soon. It's raining, it's pouring... Yay!! Hello again, my faithful readers. It's time once again for an update. On to the stitching! I am using my iPad with Blogger to post, and it doesn't always let me put pictures in the order I would like to, so please bear with me. Th first picture is from a chocolate exchange with one of my Yahoo groups from Deb Kluges. 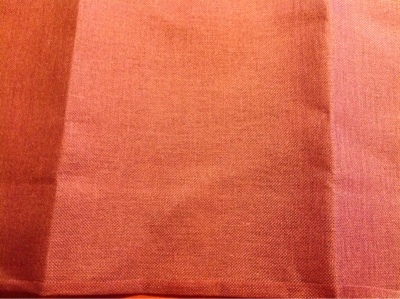 It's a lovely piece of 28 count linen in a luscious raspberry chocolate colour! The picture does not do it justice! Thank you so much again, Deb! 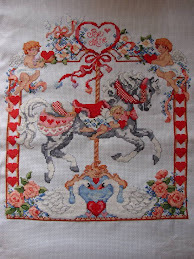 The second picture is some stitching I have done for another Yahoo group. It's a combination of an exchange and challenge. 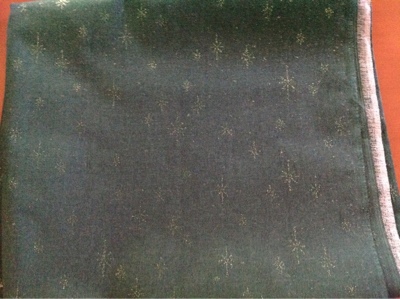 Heading to visit my parents tomorrow to raid Mom's fabric to finish them up. One gets sent to my partner, and the other two I keep. My exchange ornament will be on its way to you early next week, Tricia! The third picture is my July TUSAL update, both for the last month and year to date. Last week DD and I trekked to the big city for some retail therapy. Of course no trip to the big city is complete without a stop at our LNS. 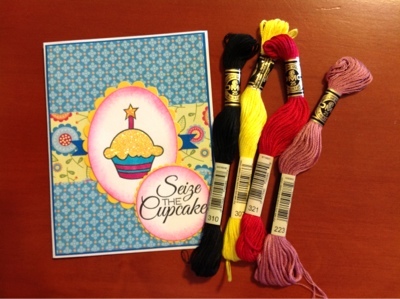 I picked up some floss and fabric and goodies for a Birthday thread exchange for The Stitch Specialists Yahoo group. (pictures will be in a later post, after my partners recieve their packages) I have the items all bought for my last two partners, which will both go out next week. But I couldn't resist a little something for me! Those scissors in the 5th picture were screaming at me, yelling "Buy Me!". 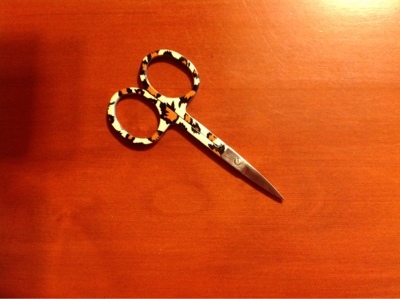 Plus I have lovely freebies of cheetah-y needlework patterns that these scissors were made for! That is what I am sticking with. 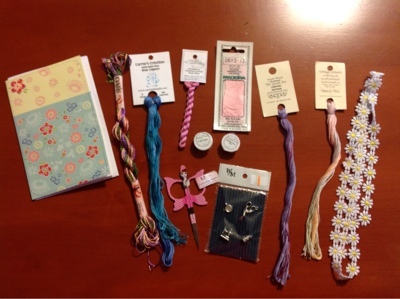 My last picture is the Thread Exchange for The Stitch Specialists Yahoo group from Theoria from South Africa. As you can see, she spoiled me absolutely rotten! 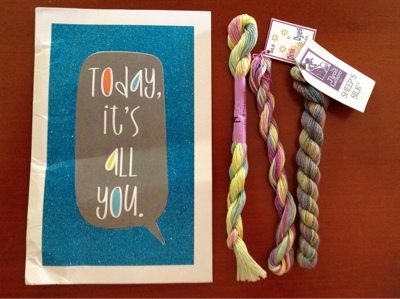 I am still fondling all the lovely threads and bits and bobs! lol. Thank you so much again, Theoria. I can't wait to play with everything! As well, just today I got an email from 1-2-3 Stitch saying that I have a $10 gift certificate from Barbara Crawford to spend there, in the same birthday exchange. I have had a great stash week! Well we have come to the end of my update. Hope the weather is treating everyone well, wherever you are. Chat soon! Ding Dong, the Witch is Dead...I mean finished! Hello, my faithful readers. It is time once again for me to update my blog. 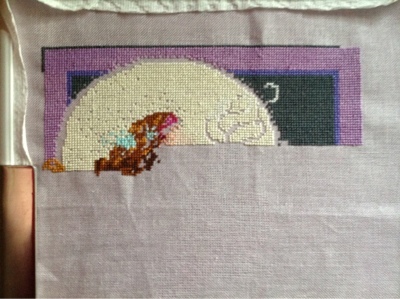 Things are finally slowing down for me, which should give me time for a little more stitching. Here is my latest finish, just finished last night, as a matter of fact. 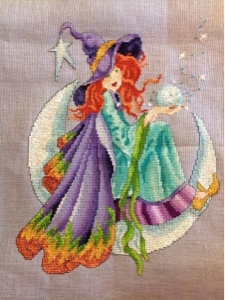 Yes, Stoney Creek's Stardust and Moonbeams Witch is finally done! She turned out rather well, if I do say so myself. And I have been stashing, buying books and threads and floss and fabric. 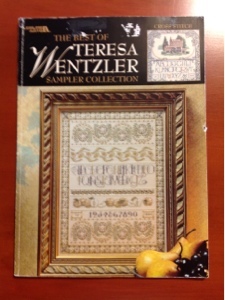 I finally have all Teresa Wentzler's books. 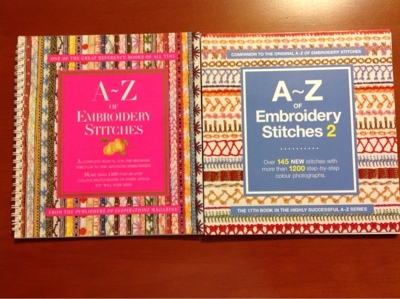 These two stitch books I have wanted for a while, so they are a nice addition to my expanding library. I bought this fabric for my Victorian Sampler Gingerbread Stitching House, as well as the Gingerbread Etui Stitcherama cyberclass I'm taking in September. Plus Thea has hinted that a new gingerbread building will be released this fall. Made sure I bought lots of fabric, so I wouldn't run out. 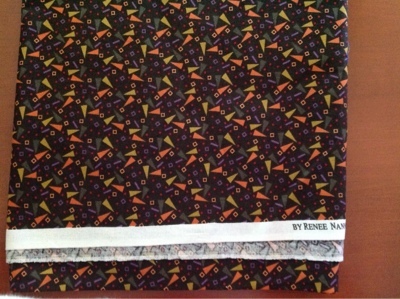 This fabric is for some Halloween ornaments I have kitted up. And I think it will go with quite a lot. These are from a birthday thread exchange for one of my Yahoo groups. The top one is from Jeanne and bottom one from Meg. Thanks so much, ladies! I sure got spoiled! Here is my stashing efforts for the last month. 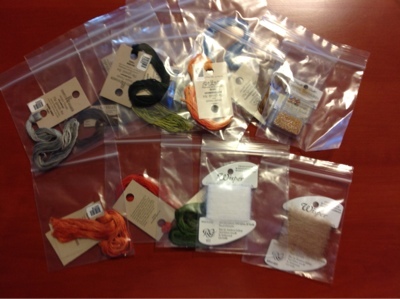 Lots of fabric and threads to play with! 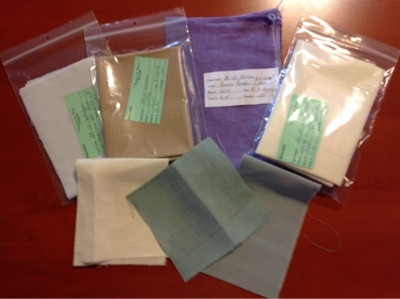 Have been a very good customer at my LNS, Thread'n'Eye. The chart with the charm was in the discout bin for $2! What a steal! 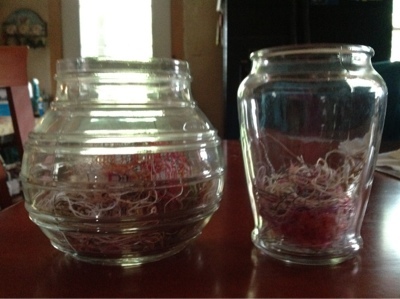 A couple blog posts ago, I showed you my flower beds, so now here are my containers. 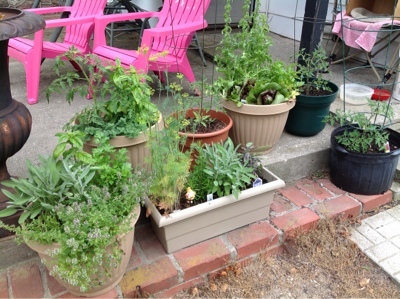 Love watching my herbs and tomato plants grow. 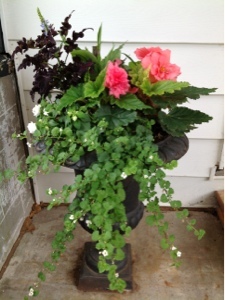 And I am trying something new with my flowers and urns. 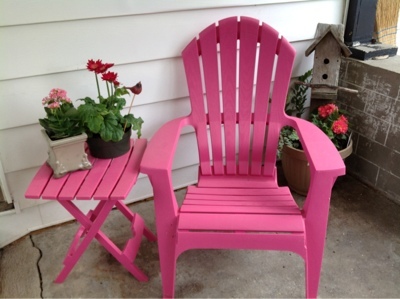 Pink flowers to match my new pink chairs! You know I love my pink! 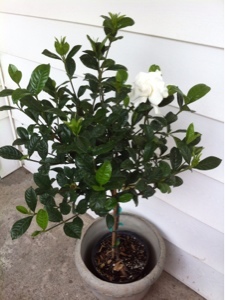 Plus, the last picture is my pride and joy, a gardenia tree!! My mom picked it up for me while visiting my sister the beginning of the month. The blooms smell so beautiful. Last week my DD graduated from Grade 8. The dinner and awards ceremony was lovely, emotional and very sweet. DD won both the music and art awards. Afterwards, us parents watched our children get into a limo for their own private celebration. They went to the lake and a variety store, and drove around reliving memories. A great time was had by all. 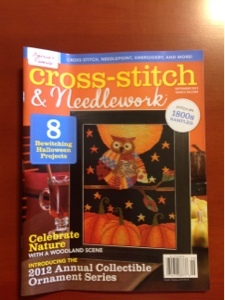 Will be working on getting my stitching projects in order, they are kind of un-organized right now. My craft room has been used as a dumping ground for scrapbooking and stitching things, and I need to do some tidying so I can get some exchanges ready to go out for a couple of my Yahoo groups. This means your ornament, Tricia! ;) And then I want to get caught up on ATW, and work on my two BAPS TW Designworks Spring Carousel Horse and Mirabilia's Cinderella. Well, we have come to the end of another update. This is the first holiday weekend of the summer, Canada Day on Sunday. Hope everyone enjoysthe coming summer, winter for my friends in the southern hemisphere! Chat soon!